Where else could I possibly have been on a chilly Saturday evening? In the upstairs of an old antique shop in Mutual, OH we gathered on a motley collection of chairs and benches to listen as Daniel Dye and the Miller Road Band filled that room to the creaking rafters with their playing. I think it was the rawness that made it wonderful, the fact that the cracking plaster and weather worn window panes weren’t there for a trendy vintage look, but because the building has seen a hundred of these winters. It was the sincerity of the people on stage, bundled in their hats and sweaters, who play because they love the music and the stories of these songs. Anyone could have come to the show and felt like family. A bowl of hot food and a cup of coffee from downstairs helped with that. Taking a seat on one of the benches along the wall surrounded by the smell of kerosene heaters doing their best to keep the chill at bay could only have added to the feeling. The easy, familiar interaction between the band and their audience would have topped it off. Until, at the end of it all, circled around the last heater, under the gritty glow of bare bulbs strung across the stage, you felt the fellowship and joy of honest artistry and story telling among friends. There are two things that usually make my day feel grumpy and groggy: spending too much time in front of a screen, and shopping. Yesterday was a fantastic combo of both these things. After spending a lazy morning “recovering” from the first half of the week with some Dr. Who and hot coffee, we decided to go out. It was a bleary, rainy day and Dr. Who somehow turned into binge watching Scrubs and the coffee turned to tea and then back again and we got quite restless. So shoes and socks and jackets and we were out the door with not much sense of direction. I had very responsibly clipped some coupons from the Sunday paper for useful things and had the brilliant idea that we should go use them. Unfortunately, we are extremely distractable and between the store entrance and the body wash aisle we ran into more than a few things. Pickles, strawberries, an exacto knife and a five pound bag of whole wheat flour, and the list goes on. At least our impulse buys are wonderful things! But having spent more time, money and good humor then we planned, we were short on all of those as we left the store. With an unhappy drive home under an angry sky, things were looking bleak. So when we took the short cut home that ran past a pull off overlooking the river we knew exactly what needed to be done. We didn’t have a knife but a short search of the car turned up a (still wrapped) fork from Wendy’s, and a pair of fingernail clippers hidden inside the grimy change in the dashboard. The wind outside was a little more than we bargained for but I was determined to have my mango and enjoy the muddy spring scene of trees and dirty water. 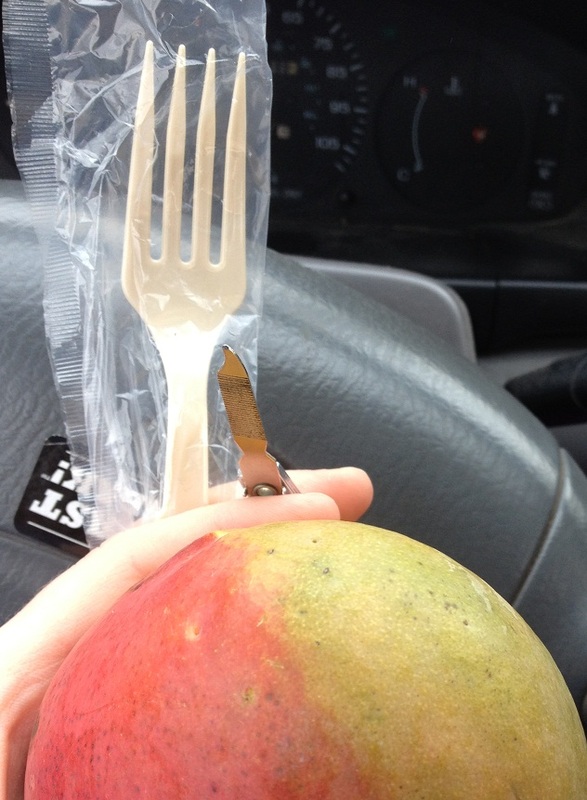 It turns out I am an expert at fingernail clipper and fork wielding and I got my mango, delicious and juicy. Watching the juice drip off my freezing cold fingers and blow down to the water I started to feel a lot better. The moral of this story is when feeling restless and grumpy it often helps to go get a little gritty. Eat a mango and get chilly and sit on the dirty, broken asphalt that used to be a bridge to watch a muddy river flow by. Bonus: Levi found some Lego pieces in the dirt, so all together a very successful trip!